Dark Horse is a big fan of Lady Killer, the best-selling series by Joëlle Jones. 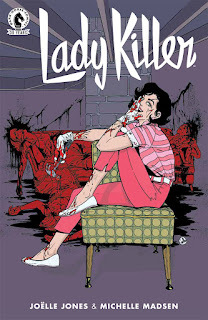 The series was a hit and the publisher is more than happy to oblige its fans by announcing Lady Killer 2, due in stores August 3. Lady Killer 2 features Jones resuming her role as writer, artis, and cover illustrator, with colors by Michelle Madsen. And to celebrate Dark Horse Comics’ thirtieth anniversary, artists Matteo Scalera and Moreno Dinisio are producing a special variant cover for issue #1. Lady Killer 2 #1 (of 5) is in stores August 3, 2016. Full press release below. FOR IMMEDIATE RELEASE: MILWAUKIE, OR— After its original announcement at San Diego Comic-Con 2015, Dark Horse Comics is happy to confirm the release of Lady Killer 2, the long-anticipated sequel to Joëlle Jones’s best-selling series Lady Killer.